Did Sweden just sign up to principled Internet surveillance? This article was first published on The Local. This week in Seoul, while speaking at a ministerial-level conference on Internet governance issues, Sweden’s foreign minister Carl Bildt did a remarkable thing. SeoulCyber2013 is the first high-level meeting on Internet governance since the summer, when Edward Snowden began revealing the extremes to which the US and other countries will go to surveil internet use, with scant regard for user privacy. Post-Snowden, these conferences can no longer ignore the fact that among the biggest threats to a thriving Internet are states’ own policies and actions, including those made by democracies in the absence of transparency and public oversight. What the limits should be of state action in cyberspace is far from settled. At the Stockholm Internet Forum in May 2013, a coalition of civil society organizations first mooted a set of legal principles that would constrain state cyber-surveillance activities. In their view, to the extent that surveillance is necessary to protect the interests of a state’s citizens, it should be conducted in accordance with human rights law, protecting privacy and freedom of expression. These principles, now 13 in number and listed on the Necessary & Proportionate campaign site, make for a remarkable document, because by signing it, the 280 sponsoring NGOs are explicitly conceding that surveillance can be a legitimate state activity, in certain cases trumping an individual’s right to privacy. Although the influential Electronic Frontier Foundation signed it, some of its activist members felt this conciliatory act was hard to swallow. At first, the 13 principles did not seem to gain much traction with states. In Sweden, some members of the Internet policy establishment were privately dismissive of such initiatives — Sweden, they argued, had already had a vigorous and contentious parliamentary debate about surveillance which had resulted in the FRA (signals intelligence) law. Re-opening that particular can of worms just to adhere to a wish list of best practices was not a viable or desirable option. But this was a sentiment from the pre-Snowden era. In September, the principles were submitted by NGOs to the United Nations Human Rights Council in Geneva, where they got a favorable hearing by UN human rights experts, including the Special Rapporteur Frank La Rue. Suddenly, Sweden is heading for common ground with NGOs in balancing the prerogatives of digital statecraft with the human rights of Internet users. The overlap is not complete — Bildt’s speech skips a number of additional principles proposed in the NGO document — but there is no doubt that this step amounts to tangible progress in getting these principles promoted to norms that states can aspire to, with Sweden being the first country (that I am aware of) to openly articulate this ambition. Of course, the devil is in the details, and questions remain: Are there policy implications for the Swedish government in embracing these principles, or will the government maintain that Swedish law already conforms to all these norms? One example: The principle of transparency calls on states to, in Bildt’s words, “provide information on how the surveillance legislation works in practice.” The FRA law as it stands today only compels the signals intelligence agency to report back to the “relevant authorities”; the Swedish public most certainly does not get access to how it works “in practice”, not even to aggregate information on how often requests are made, or broadly to what end. Still, thinking creatively, it’s worth noting that there is nothing in the FRA law that prohibits the government from sharing aggregated information with the public. Meanwhile, are the “missing” principles missing because they directly contradict current Swedish law? For example, is the principle of ensuring the integrity, security and privacy of communications systems, which would prohibit states from forcing Internet service providers to preemptively retain customers’ metadata, “missing” from Bildt’s list because it contravenes Sweden’s data retention law, passed in 2012 to put the country in line with European directives? And amid press reports of Sweden frequently sharing intelligence with the NSA, will there be policy adjustments towards countries that do not share Sweden’s principles for ethical surveillance practices? In the same vein, it would be hypocritical of Sweden to uphold these principles if the FRA gets to circumvent them merely by outsourcing all ethically questionable intelligence gathering to a less scrupulous foreign ally. Where do we go from here? By next year’s Stockholm Internet Forum, why not present the results of an independent audit assessing Sweden’s practical compliance with these principles? Let’s say Sweden scores a 6 out of 13. That would be enough to propel the country into first place in a one-country league table of all countries submitting themselves to such public scrutiny, and it would begin a process that the rest of the world can join to build a freer, more secure Internet for all. Two weeks ago in Stockholm, half a dozen technologists hunkered down for a whole-day workshop with Sweden’s foreign-facing government agencies (the usual suspects: The Swedish Institute, VisitSweden, the Swedish Trade Council and the Ministry of Foreign Affairs). The assignment: Brainstorming the future of Sweden’s digital public diplomacy. Part of my presentation looked at the evolving nature of the power wielded by states as societies get networked digitally, and how a new theoretical framework might be needed to explain what has been happening in the Middle East and elsewhere this year. Intriguingly, a recently proposed network-centric theory of power appears to favor Sweden’s open and collaborative nature as a multiplier of its influence globally. In this world, the state with the most connections will be the central player, able to set the global agenda and unlock innovation and sustainable growth. Here, the United States has a clear and sustainable edge. Since then, her thinking has evolved. Back in 2009, she did not explicitly refer to the hard power/soft power framework of her mentor, but in a new article published a few weeks ago in The Atlantic, she contends that Nye’s framework lacks analytical clout with the kind of power that dramatically upended a slew of regimes in the Middle East this year. Her main point is that Nye’s concept of power is limited to that of “power over” others, whereas the new kind of power mustered on Tahrir Square and in Tunisia is “power with”. The former is top-down, defined in terms of relationships between groups (“relational power”), while the latter is bottom-up, guided and enabled by the logic of informal networks, including digital ones. The term Slaughter settles on for this new power varietal is “collaborative power”. How is the United States positioned to “unlock and guide” this collaborative power so it aligns with its own interests? How is Sweden positioned? In her 2009 essay, Slaughter lists a series of cultural, social and demographic traits the US possesses which give it an edge in this “networked century”. In most cases, to the extent that these traits favor the US, they also favor Sweden. My hypothesis is that Sweden is very well positioned to become a collaborative superpower, in some case more so than the United States — especially in the Middle East. Slaughter posits that in the networked age, a small population is an asset: While territory and population are certainly resources that have contributed to hard power, global trade now ensures that a state’s wealth is no longer tied to the size of its internal market. Smaller populations are more manageable, politically, in part because they are less prone to secessionism. Slaughter considers the US, with its 300+ million people, to have a limited population, at least when compared to that of China or India. At 9.4 million, Sweden’s population is similar to that of New York City, and over an order of magnitude smaller than that of the US. And while the US is not riven by secessionism (pace Alaska and Texas and Puerto Rico and Hawai’i) its political system is besieged by an increasingly ideological intransigence that has some regional bias. In Sweden, meanwhile, mere policy tweaks separate the left from the right, and the electorate resolutely favors technocrats over populists. Immigrants are an asset in the networked age, because they contribute strong trusted connections back to their country of origin, facilitating trade and the spread of ideas. (The Economist most recently chimed in on the benefits of diaspora networks.) America’s famed heterogeneity is rightly tagged by Slaughter as a magnet for the world’s creatives and entrepreneurs, no matter what their origin. But while the US has always been attractive to immigrants, America’s immigration policy is no longer requiting their overtures. Post 9/11, there’s been a turning inward, a hardening towards the notion of immigration. Slaughter acknowledges this, calling for US immigration reform that recognizes the positive impact of diaspora communities. Sweden, in contrast, is often perceived as a homogeneous nation of blue-eyed gentle giants. But the numbers tell a different story. 14.7% of its population is foreign-born, a percentage that is rising. The US foreign-born population stands at 12.5% of the total, and is stagnant or declining in absolute terms. Granted, a portion of Sweden’s foreign-born population, like myself, hails from the rest of Europe, but that is the case for the US as well. Sweden has long had a generous asylum policy, welcoming Chileans fleeing Pinochet, Iranians fleeing the mullahs, and most recently, Iraqi Assyrians fleeing religious persecution in the aftermath of the Iraq war. One town alone in Sweden took in more Iraqi refugees than all of the United States combined. And alone among its Nordic neighbors, Sweden appears to have inoculated itself against immigration fatigue; the anti-immigrant Sverigedemokraterna party remains on the fringes, with a stagnant 5-6% support in opinion polls. Immigrants, then, are set to remain a strong asset for Sweden in forging trusted networks with the rest of the world. Another competitive advantage, according to Slaughter, is that America’s youth is increasingly seeking international exposure. The problem is that global engagement has historically not been America’s strong suit (with a notable and appreciated exception in WWII). It’s great that this latest cohort of Americans to deserve a moniker are using their passports “far more frequently” than older generations, but the historical comparisons are not that hard to beat. It’s safe to say that nothing comes close to the Swedish zeal for global immersion. Swedish backpackers swarm the hostels of the world, while Swedish families lord it over the slopes and beaches. The evidence is not just anecdotal: Some rather gruesome statistics for the 2004 Indian Ocean earthquake and tsunami list casualties for countries that lost citizens travelling abroad in the region. Sweden suffered 543 casualties in that disaster, second only to Germany’s 552, and compared to 51 American deaths. The casualty rate per million inhabitants is truly shocking: Sweden lost 58.1 citizens per million, followed by Finland’s 33.4 and Norway’s 17.3. The United States, in comparison, lost 0.2 citizens per million. In terms of global engagement, the First Globals have a lot of catching up to do. Slaughter argues that the United States is far more innovative than China, because innovation requires a cultural inclination towards “constructive conflict”, the kind that drives creative destruction and which is found “on American playing fields, in American courtrooms, and in the American political system.” Innovation requires not just critical thinking but the challenging of authority, says Slaughter, and that is a trait China’s rulers are simply not willing to encourage. Promoting new, cross-sector collaborations to find solutions to needs; solutions to social and societal challenges are rarely found in one traditional sector or a single research field. New collaboration patterns are emerging between actors in different value chains; for example ‘green urban transportation’ is being developed at the interface between energy, automotive engineering and ICT. Hints of this kind of strategizing can be found in how China has begun promoting industry alliances around emerging green technologies. Different innovation models suit different national temperaments born of historical contingencies — Sweden and the US should under no circumstances switch models. Two observations are worth making, however: First, conflict-driven innovation is not as network-friendly as collaborative innovation — the former is firmly rooted in the dynamics of relational power. Collaborative innovation is far better suited to the projection of collaborative power, according to Slaughter’s own network-centric theory of power. Second, global innovation metrics show that while both Sweden and the US do well in global rankings (Sweden comes second after Switzerland, the US is in seventh place, vs 29th place for China) most other countries in the top 10 have innovation models similar to Sweden’s. America may be exceptional, but it is not peerless. Although trust and transparency are not unique to the United States, it is still one of the most open societies in the world. The Internet world, the wiki world, and the networked world all began in the United States and radiated outward. The US sets the gold standard for its embrace of open government data, especially after the initiatives by Obama’s administration over the past few years. Most NGOs that embrace networks to mobilize for government accountability, net freedom or democratization have American roots, a marriage of America’s talent for civic-mindedness with a vibrant can-do hacker culture. The academic institutions studying Internet and society are also predominantly American. Events such as the Personal Democracy Forum in New York are a Mecca for networked activists the world over. Such thought leadership is a great asset in the networked era. But hard power prerogatives can and do undercut this reputation. The US government’s reaction to the Wikileaks diplomatic cable dump betrayed a controlling muscle reflex over American companies such as Mastercard, Paypal and Amazon that worked against the public interest. America’s hard superpower legacy requires it to adopt all kinds of realpolitik-al stances that are inimical to the ideal of openness and transparency. The public airing of such machinations through Wikileaks led to a hypocritical and extrajudicial response that even Slaughter was caught up in. Sweden’s diplomacy is a far more open book, with a foreign minister that tweets from the hip, and where the electorate expects public positions on international issues to match what is privately communicated. Of course there is secrecy, but it is in the service of discretion, not conspiracy. I suspect an equivalent leak of Swedish diplomatic cables would be far less damaging to Sweden. I don’t see the new [US] Internet Freedom policy as independent from the broader and decades-old US foreign policy, which has been based on practical rather than ethical and moral considerations such as the support for human rights. As we all know in this part of the world, in the name of a short-termed realpolitik, the US has been supporting all kind of dictatorships at the expense of democratic and reformist movements and aspirations. Sensitive to the possibility that Sweden sponsoring such a program might be characterized as outside meddling in the internal affairs of another state, we surveyed YLVP alumni for feedback in May 2011. A large majority said that such a characterization would be unfair. Surprisingly, to the extent that some felt YLVP did amount to “outside meddling”, they were in favor of it. On January 20, 2009, Barack Obama will set about restoring the moral authority of the United States. The networked world provides a hopeful horizon. But the networked world has not so much served as a tool in this restoration as an autonomous organism highly attuned to discrepancies between words and deeds. In the Middle East, Obama’s two inspirational speeches on US diplomacy in the region were no match on Twitter for his administration’s subsequent inability (or unwillingness) to hold its closest allies — Saudi Arabia, Israel, Bahrain — to account for their continued flouting of human rights laws. In her Atlantic article from two weeks ago, Slaughter’s case study on the effective use of collaborative power narrates the recent spontaneous Twitter initiative to press for the release of the Egyptian-American journalist/activist Mona Eltahawy after she was detained by Egyptian security forces near Tahrir Square. I do not however see this as an example of the state mobilizing a networked collaboration of activists to achieve a positive outcome — rather, the reverse: Activists successfully mobilized America’s hard-power influence over the Egyptian military regime via Slaughter’s State Department contacts. A networked world requires a genuinely networked society, which means fostering economic and social equality. The United States has never been as egalitarian as it imagines itself to be, but this divide has worsened in the past decade, as the rich have become the superrich. While the Kingdom of Sweden is also not as egalitarian as it imagines itself to be, it is by at least one major measure the world’s most egalitarian society: Sweden’s Gini coefficient, which measures income inequality, is the world’s lowest at 0.23. (The US, at 0.45, ranks 100th out of 140, according to the CIA World Fact Book). Other more offbeat pointers to a deeply horizontal society include sky-high choral participation rates, near-universal Internet access, the concept of “lagom“, and the invention and embrace of the ombudsman. At the risk of having been long-winded, I hope I’ve made the case that Sweden is well positioned to thrive in the networked century. A nimble, innovative and open society such as Sweden has all the right qualifications to mesh itself deeply within trusted networks that are able to mobilize collaborative power. The notion of Sweden as a collaborative superpower can sound boastful to modest Swedish ears, but it is important to remember that collaborative power is not the ability to command a network; rather it is the ability to align with a trusted network so that common ideals can be fought for and achieved far more effectively. Many of these ideals — open societies, democracy, Internet freedom — are shared by the US, Sweden and by the Arab youth at the vanguard of the Arab revolutions. But if a lack of trust is preventing US-funded initiatives from effectively connecting with the networks driving these revolutions, then perhaps the best solution is for the US not to spend more resources knocking on locked doors. Leave the job of networked collaboration in the Middle East to countries not afflicted with hard power, such as Sweden. The distinction between soft power and collaborative power can be blurry at the edges: Much of what contributes to soft power can also position a country for collaborative power. But soft power is often a resource-intensive pursuit — money does buy brains, build research institutes, and feed starving artists — whereas collaborative power is relationship-intensive — its currency is trust, which enables collective action towards a common goal. And Swedes are easy to trust, in part because they are always seeking consensus: It is what knits together their choirs, what underpins their collaborative innovation processes, and what drives their diplomacy. The ideas brainstormed at the workshop on the future of Sweden’s digital public diplomacy are still far too tentative to sketch out, but it’s worth musing on some general strategies for Sweden that a network-centric world implies. In a collaborative power dynamic, the network quickly disseminates best practices for the good of all, with a concomitant boost to the reputation of the originator. In this context, gaining reputation is akin to “moving to the center” of a network, improving both the quantity and quality of connections. This should be Sweden’s aim in its digital public diplomacy. Sweden has plenty of best practices to share with the world — and the world has plenty to share with Sweden. For Sweden’s foreign-facing government agencies, the challenge becomes ever tighter integration and interaction with the networks along which these ideas travel. Where networks are scarce, it is in Sweden’s interest to build up their physical capacity. As a nation-state, Sweden has considerable resources available (when compared to NGOs and civil society actors) to build the foundations for networks that can grow autonomously around prioritized issues. Both YLVP and She Entrepreneurs, a network connecting young female social entrepreneurs in the Middle East with mentors in Sweden, are great examples of such capacity building. Finally, even open networks need to be trusted before they can be used to build trust. For digital networks, this means they need to be safe and secure for users, regardless of where they live. Power attracts attention, and the collaborative power residing in a network is no different. Digital natives cannot afford to be digital naïfs about the fact that censorship, surveillance and cyber-attacks constitute a real systemic risk to networks. The Swedish state should not be responsible for securing such networks but it can work with others do get the job done. Fortunately, Sweden has recourse to some great hacktivist talent. So: Build networks, secure networks, engage networks. These are three useful motifs around which Sweden can structure its future digital public diplomacy efforts. The devil is of course in the details. Two items make a trend, right? Perhaps the organizers were under the impression that getting the #LondonCyber Twitter hashtag to trend would be a sufficient proxy for civil society participation in an otherwise closed talking shop. No doubt they anticipated the criticism, and some tech-savvy mandarin came up with the “Let them tweet hashtags” solution. And never mind the audacity of David Cameron fishing for tweets so publicly just months after the London riots had him running to sacrifice social media at the altar of public security. 2. 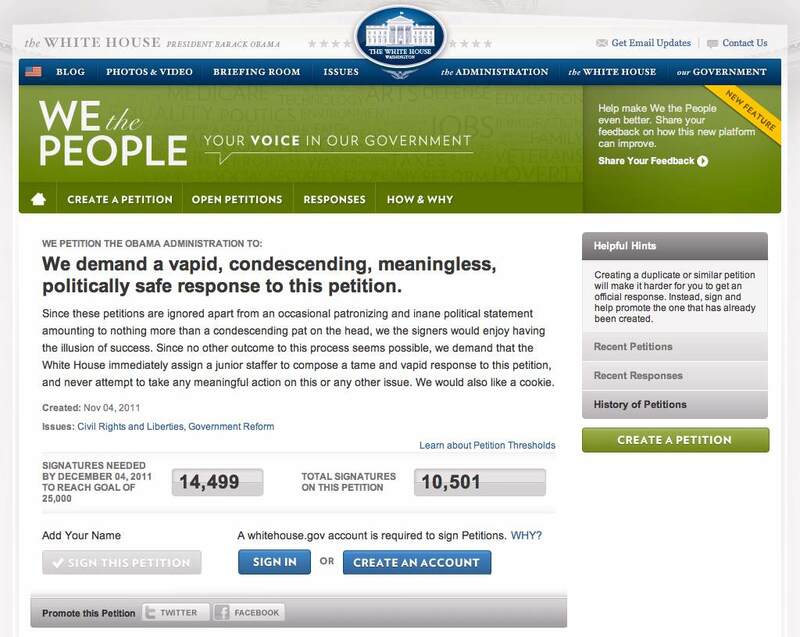 WhiteHouse.gov, in its zeal to embrace participatory media, now allows people to start petitions, promising an official response upon sufficient signatures. The problem is that these petitions do not lead to policy change, but to rote copy-paste responses that rehash the administration’s line (exhibit one and two). We demand a vapid, condescending, meaningless, politically safe response to this petition. Since these petitions are ignored apart from an occasional patronizing and inane political statement amounting to nothing more than a condescending pat on the head, we the signers would enjoy having the illusion of success. Since no other outcome to this process seems possible, we demand that the White House immediately assign a junior staffer to compose a tame and vapid response to this petition, and never attempt to take any meaningful action on this or any other issue. We would also like a cookie. Last I checked, over 10,000 had signed, with a goal of 25,000 looking well within reach.